Perhaps you’ve heard some version of this John Muir quote “When we try to pick out anything by itself, we find it hitched to everything else in the Universe.” Well, on this farm, it would read, “When we try to pick up anything by itself, we find it is hitched to a piece of baling twine“. Trust me, this is bigger than the photo makes it look. We’ve been slowly shoveling, pitch forking and sometimes hand pulling our way through a large pile of rotting hay on one side of our old barn. There used to be a roof over it. The roof collapsed in a winter snow, and then was left to rot for who knows how long. So first, we had to remove the half rotted tin roof. Then we started working on the hay, which, if the number of baling twine pieces is any indication, used to be at least 10 ft tall. 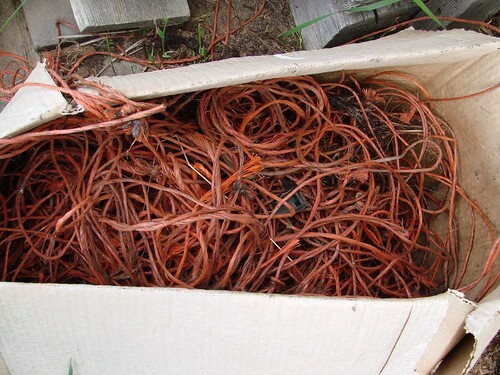 This stuff does NOT degrade, which kind of makes me wonder about landfills full of baling twine. 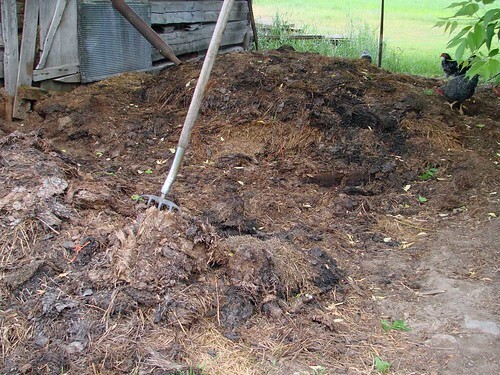 Some of the hay has fully rotted and is nice compost (along the outside edges). A little bit, in some deep spots down towards the middle, is dry compacted hay that is no longer in the shape of a bale. Most of it is an anaerobic snotty stinky slippery knotted together mess. The base of the pile is a piece of concrete, making drainage over the years a bit…well…slow. The routine is to shovel out a few scoops, stop and pull out baling twine (it pulls out quite easily, usually) and then shovel out a bit more. Then stop and try to remove the various 2 x 4’s, logs and other bits of lumber (and metal, we found an old set of heavy-duty tire chains) that likely once were used as spacers in the stack. It’s definitely not a “finish it in a day” kind of job. We considered renting a tractor with a front loader (and still may), but given how knotted up everything is, I’m not sure how much we would have been able to move it. 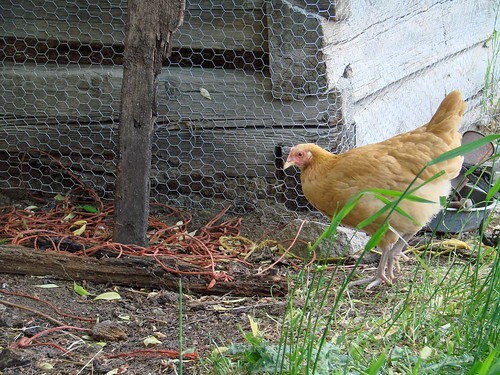 The chickens find an occasional worm, and so are happy to supervise. The barn itself is also about 4 bales deep in hay, some of which is still in bales, a lot of which is not. The door to the barn is on the side with the rotted outside stack, making removing this dry hay rather difficult. It may turn into an all-summer project. It’s already been an all spring one. Our backyard is abuzz, literally. 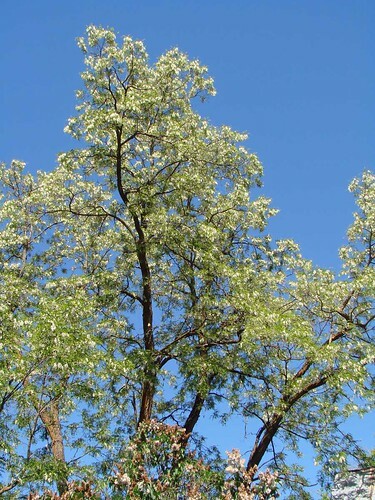 The locust trees are blooming, and the bees are going nuts. 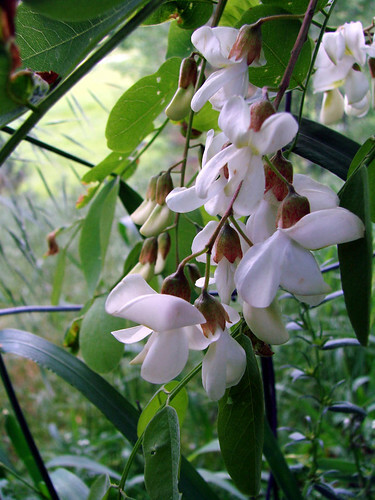 You can hear them in the trees from all over the yard, and everything smells like, well, pea flowers. These trees are some of the last to leaf out in the spring, and seem to begin loosing leaves as soon as they are done blooming. They are also rather brittle, making the occasional branch in the yard pretty common. But they provide shade on the west side of the house, food for the bees, and great firewood. And because they are a legume (i.e. pea) they can fix their own nitrogen, making them pretty easy to grow. 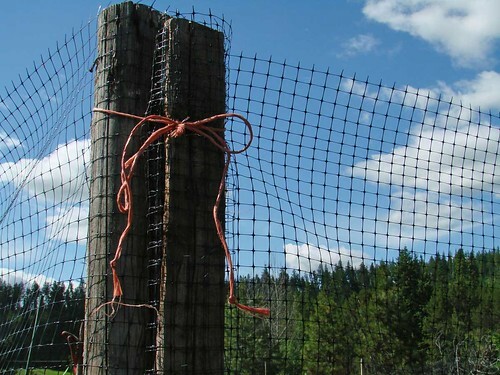 I’ve also heard that locust wood is the equivalent of juniper in the southwest when it comes to rot resistance in fence posts. I’m just happy someone thought to plant them oh so many years ago. Clearly a pea, when seen up close. The potatoes are starting to bloom. 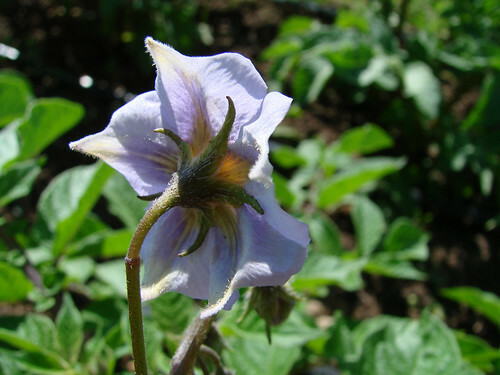 Gardening dogma has it that when potatoes bloom up top, it means they are starting to form potatoes down below. Lets hope so. Some of these took about 45 days to come up, one never sprouted, and I lost one yesterday to some kind of stem rot. I also know I have wire worms in my soil, which can get into potatoes and other root crops. So at this point, it’s a bit of a crap shoot how it will all come out. But the flowers are sure pretty. Meanwhile, whether I am shoveling hay, mowing the lawn, or just feeding the chickens, these ground squirrels let me know that I am TOO CLOSE by chipping incessantly. We have a lot of them. 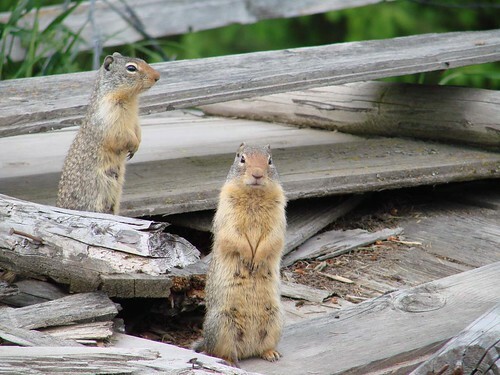 There are several slash piles on the lower section of property, which no doubt has become ground squirrel central, and they have now expanded uphill into yet another former loafing shed – now fallen down building pile. Eventually, we’ll need to do something about them, but for now, they are pretty fun to watch, and remind me of the prairie dogs from Colorado. Miles Away Farm Blog © 2011, where we’re miles away from getting the barn cleaned out, and wishing it was all magically moved to the garden.